Osteoarthrosis (synonym: Arthrosis Deformans) of the temporomandibular joint, in literature usually described as pain dysfunction syndrome, is a common disorder accompanied by clicking, pain and limited motion. The course of the disease, the roentgenology and the results of conservative treatment are well-known. The underlying processes which cause articu­lar cartilage destruction and other degenerative changes observable in case of osteoarthrosis of the temporomandibular joint are still obscure. Research on the cause of osteoarthrosis, especially regarding the hip- and kneejoint, has indicated that the initial osteoarthrotic changes occur in the collagen fibrils of the articular cartilage matrix. The collagen fibrils, which create a network, probably lose their cohesion, thus allowing the groundsubstance, which consists of proteoglycans, to leave the collagen network of the articular cartilage matrix. In this way, the articular cartilage becomes loaded in an unfavourable manner (compression forces instead of tensile forces in the collagen fibrils), is unable to function normally, and finally degenerative changes occur. One of the aims of this investigation is to obtain more insight in the pathogenesis of osteoarthrosis. The starting point for this investigation of the fibro-cartilage of the mandibular condyle was the hypothe­sis of Freeman and Meachim (1979), which states that collagen network fragmentation initiates the ar­ticular cartilage destruction which appears in osteoarthrosis. Previously the fine structure of fibro-cartilage of the temporomandibular joint was scarcely described. For that purpose scanning and transmis­sion electron microscopy were used during this inves­tigation for the first time on such a large scale. The spatial arrangement of collagen fibrils in articu­lar cartilage from healthy mandibular condyles, obtained at necropsy, was studied by light microscopy and scanning electron microscopy. The results of this study were compared with those of a light and scan­ning electron microscopic study on articular cartilage from osteoarthrotic mandibular condyles. These con­dyles were obtained either at necropsy or from patients treated with a high condylectomy. All mate­rial from patients was also studied by transmission electron microscopy to describe the ultrastructure of cells and matrix of osteoarthrotic articular cartilage from the mandibular condyle. The ultrastructural features were compared with those of articular carti­lage from healthy mandibular condyles resected during a hemimandibulectomy because of a malig­nancy in the mandibular ramus. In literature, the past years a lot of attention has been paid to form, position and function of the articular disc of the temporomandibular joint. Therefore, the collagen network of the articular disc was also studied by scanning electron microscopy. The rela­tionship between articular disc position and osteoarthrosis was studied by light microscopy of 22 temporomandibular joint autopsy specimens, prepa­red in a standardized way. To detect possible differences between fibrocarti-lage and hyaline cartilage, the collagen network of the articular cartilage of the femoral head was com­pared with that of the mandibular condyle. Healthy as well as osteoarthrotic articular cartilage was inves­tigated. The results of this thesis are now summarized, according to the contents of the successive chapters. Chapter 1 describes the state of the art concerning articular cartilage and osteoarthrosis, and the aims of this investigation. 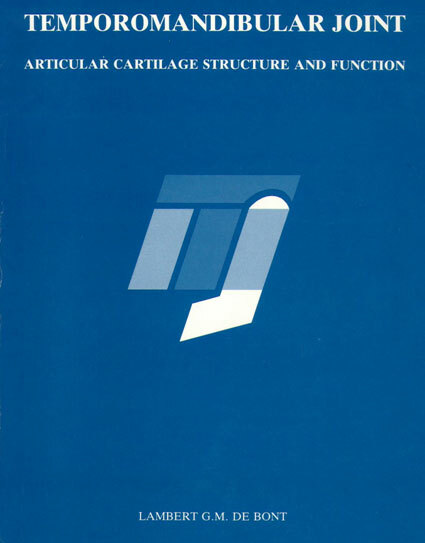 Chapter 2 reviews knowledge on structure and function of the articular cartilage of the temporoman­dibular joint. The cartilage components - cells, colla­gen fibrils and proteoglycans (groundsubstance) - are discussed. Literature about this subject of the tempo­romandibular joint is scarcely available. Chapter 3 describes the spatial arrangement of col­lagen fibrils in the articular cartilage of the mandibu­lar condyle, deduced from light microscopic and scan­ning electron microscopic observations. In this study it is shown for the first time that the collagen fibrils in the articular cartilage of the mandibular condyle are organized in layers or sheets and bundles. The layer formation, in which collagen fibre bundles orga­nized in thin bands of interwoven fibrils are observed, is found in the articular zone of the articular cartilage. The bundle-like organization is found in the deeper zones of the articular cartilage. It is concluded that the collagen fibrils create a three-dimensional net­work with a special system in each of the four distin­guishable zones of the articular cartilage. Because of the interdependence of form and function, the differ­ences in cartilage structure per zone probably indi­cate the presence of different functions of each car­tilage zone. However, the essence of these differ­ences is not clear. Chapter 4 describes the spatial arrangement of col­lagen fibrils in the articular disc of the temporoman­dibular joint, deduced from light microscopic and scanning electron microscopic observations. The col­lagen fibrils are organized in bundles creating a three- dimensional network nearly everywhere in the disc. Only in the superficial layers an anteroposterior orientation is detectable. The collagen network of the articular disc is able to resist compression forces due to loading. Chapter 5 describes the organization of collagen fibrils and other morphological aspects of articular cartilage of osteoarthrotic mandibular condyles studied by light microscopy and scanning electron microscopy. Features of progressive and regressive remodeling respectively and splitting of the deeper zones of the articular cartilage are observed. The collagen network has lost its normal organization. The collagen fibrils are disordered. Thick coiled fibrils at the joint surface and numerous osmiophilic globules scattered throughout the collagen fibrils, are found. The globules represent lipidic debris due to cell necrosis. It is concluded that collagen fibre net­work disintegration and fatty degeneration comprise the osteoarthrotic changes of the articular cartilage of the human mandibular condyle. Both phenomena, present in the osteoarthrotic mandibular condyle, have not previously been described. Chapter 6 describes the ultrastructure of articular cartilage from healthy and osteoarthrotic mandibular condyles studied by transmission electron microscopy to obtain more insight in the pathogenesis of osteoarthrosis. The ultrastructural features of cells and matrix of the articular cartilage of these condyles are compared with the results of other transmission electron microscopic studies regarding osteoarthrotic fibrocartilage as well as osteoarthrotic hyaline carti­lage. The healthy mandibular condyles (aged 53 to 88 years) show some slight degenerative changes, probably due to ageing. The osteoarthrotic condyles (aged 18 to 48 years) show several degenerative changes in the articular cartilage. Degeneration or necrosis of the chondrocytes is frequently found espe­cially in the deeper zones of the articular cartilage. The remaining cellular debris is fatty, resulting in an increase of matrix vesicles and lipid globules. An increased number of elastic fibres and the presence of giant collagen fibrils are also noted. The collagen fibrils at the articular surface disintegrate into fila­mentous and fine granular material. The mechanical capacity of the osteoarthrotic articular cartilage matrix is impaired by this collagen fibril fragmenta­tion and by the presence of elastic fibres and giant collagen fibrils. Both cells and matrix of the articular cartilage appear to be affected by osteoarthrosis. Unfortunately, cause and effect could not be distin­guished from each other. The degenerative changes might occur simultaneously, enzymatically induced from the synovial fluid. The degenerative changes of osteoarthrotic fibrocartilage of the mandibular condyle show a striking similarity with those found in osteoarthrotic hyaline cartilage from other synovial joints. Therefore, it is concluded that osteoarthrosis is a synovial joint dis­ease without differentiation between fibrocartilage and hyaline cartilage. This statement has never been made before. Chapter 7 describes the relationship between osteoarthrosis and displacement of the articular disc of the temporomandibular joint, studied by light microscopy of 22 randomly selected autopsy speci­mens (aged 54 to 92 years). Prior to dissection, the lower jaw was placed in the intercuspal position and the temporomandibular joint was deep frozen. The frozen specimens were sawed into five-mm thick sagittal slices. Disc position remained unchanged. The obtained slices were fixed, contact-radiographs were exposed and seven-^m thick serial sections were prepared. Normal disc position is seen in eight joints, partially anteriorly displaced discs in eight joints, completely anteriorly displaced discs in five joints; and one joint shows a perforated disc. Partially dis­placed discs are only displaced in the lateral part of the joint or in the lateral as well as in the central part of the joint. Degenerative changes, such as lipping due to osteophyte formation, sclerosis of the subchondral bone, subchondral cysts, erosions of the articular sur­faces, deformation of the mandibular condyle, flatten­ing of the fossa and reduction in temporomandibular joint size are macroscopically observable. Horizontal splitting of the articular cartilage at the level of the uncalcified-calcified interface, clustering of chondro­cytes and fibrosis of the bone marrow are only micro­scopically detectable. The articular zone usually remains unaffected. The degenerative changes appear to occur especially in the deeper zones. The articular zone appears to adapt to these changes. All joints with a displaced disc, except three, show severe degenerative changes, especially located in the lateral part of the joint. However, four of eight joints with normal position and form of the articular disc also show degenerative changes. It is concluded that dis­placement of the articular disc appears to be a sign of osteoarthrosis of the temporomandibular joint and appears not to be the cause of osteoarthrosis. Chapter 8 describes the organization of collagen fibrils of the articular cartilage of healthy femoral heads, deduced from light microscopic and scanning electron microscopic observations. The purpose of this study was also to reveal possible differences between fibrocartilage and hyaline cartilage. The col­lagen fibrils of the femoral head articular cartilage are randomly arranged and regularly organized throughout the tissue. Underneath the articular sur- face the collagen network in the superficial zone shows a tighter appearance when compared with the homogeneous collagen network in the deeper zones. It is concluded that in hyaline cartilage, in contrast to the fibrocartilage, the collagen fibrils are not orga­nized in bundles or in sheets. The collagen fibrils create a homogeneous, three dimensional network. Chapter 9 describes the degenerative changes and morphological characteristics of an osteoarthrotic femoral head, studied by light microscopy, scanning and transmission electron microscopy. Several degen­erative changes are presented. The presence of elastic fibres in osteoarthrotic hyaline cartilage has never previously been described. It is concluded that disin­tegration of the collagen network and fatty degenera­tion of the matrix are the essential mechanisms in the pathogenesis of osteoarthrosis. In Chapter 10, the General Discussion, the differ­ences between articular fibrocartilage and hyaline cartilage are discussed. The organization of collagen fibrils in healthy fibrocartilage differs from that in hyaline cartilage. However, the osteoarthrotic chang­es at an electron microscopic level show a striking similarity. In contrast with most other synovial joints, the relationship between ageing and osteoarthrosis is not so clear for the temporomandibular joint, because the onset of osteoarthrosis of the temporo­mandibular joint mostly occurs in the third decade. In general it is assumed that osteoarthrotic articular cartilage shows defects at the articular surface with light microscopic observations. However, the tempo­romandibular joint articular zone seems to be unaf­fected with light microscopic observations. Therefore our study proposes to broaden the definition of osteoarthrosis by including the degenerative changes of the deeper zones of the articular cartilage and the subchondral bone, whereas at first the articular zone may remain unaffected. In our opinion, partial and total displacement of the temporomandibular joint disc are part of the osteoarthrotic process. Osteoarthrosis (synoniem: Arthrosis Deformans) van het kaakgewricht, in de literatuur veelal pijn-dys-functiesyndroom genoemd, is een frequent voorko­mende aandoening die gepaard gaat met knappen, pijn en bewegingsbeperking. Over het klinisch beloop, de daarbij behorende röntgenologische ken­merken en de resultaten van conservatieve therapie is reeds veel bekend. Daarentegen zijn de processen, die leiden tot kraakbeenverval en andere degenera­tie ve veranderingen nog steeds niet precies bekend. Onderzoek naar de oorzaak van osteoarthrosis van met name het heup- en kniegewricht heeft duidelijke aanwijzingen opgeleverd dat de initiële veranderin­gen plaats vinden in de collagene vezels van de kraak-beenmatrix. Deze collagene vezels, die bestaan uit fibrillen die een netwerk vormen, zouden hun onder­linge samenhang verliezen waardoor de tussenstof, bestaande uit proteoglycanen, uit het netwerk res­pectievelijk uit de matrix zou treden. Het kraakbeen zou hierdoor ongunstig worden belast (drukkrachten in plaats van trekkrachten op de collagene fibrillen) en niet meer in staat zijn de normale functie te ver­vullen met als gevolg degeneratieve veranderingen. Het onderzoek voor dit proefschrift werd opgezet om meer inzicht te krijgen in de pathogenese van osteoarthrosis. Als uitgangspunt voor onderzoek van het vezelkraakbeen van de kaakkop werd genomen de hypothese 'Fragmentatie van het collagene net­werk in articulair kraakbeen veroorzaakt het kraak­beenverval dat plaatsvindt bij osteoarthrosis', zoals geformuleerd door Freeman en Meachim in 1979. Tot aan het begin van dit onderzoek was over de structuur van het vezelkraakbeen van het kaakge­wricht op electronenmicroscopisch niveau nog weinig bekend. Voor het eerst werd voor dit doel op ruime schaal gebruik gemaakt van zowel scanning als trans­missie electronenmicroscopie. Aan de hand van obductiemateriaal werd het col­lagene netwerk van articulair kraakbeen van gezonde kaakkoppen bestudeerd en in kaart gebracht met behulp van lichtmicroscopie en scanning electronen­microscopie. De resultaten hiervan werden vergele­ken met die verkregen uit articulair kraakbeen van arthrotische kaakkoppen, dat op dezelfde wijze werd bewerkt. Deze arthrotische kaakkoppen werden ver­kregen als obductiemateriaal of waren afkomstig van patiënten behandeld met een hoge condylectomie. Al het patiëntenmateriaal werd tevens bewerkt voor transmissie electronenmicroscopie om het ultrastruc-turele beeld te krijgen van cellen en matrix van osteoarthrotisch articulair kraakbeen. Deze ultra-structurele bevindingen werden vergeleken met de ultrastructuur van articulair kraakbeen van niet-arthrotische kaakkoppen die werden verwijderd bij oncologische ingrepen aan de onderkaak, waarbij in verband met een maligne proces in de opstijgende tak van de onderkaak een hemimandibulectomie werd verricht. Omdat aan de vorm, positie en functie van de discus articularis van het kaakgewricht in de litera­tuur de laatste jaren veel aandacht werd geschonken, werd tevens het collagene netwerk van de discus arti­cularis met behulp van scanning electronenmicrosco­pie bestudeerd. De relatie tussen vorm en positie van de discus articularis en de aanwezigheid van osteoarthrosis werd met behulp van de lichtmicroscoop bestudeerd aan de hand van een 22-tal complete kaakgewrichten die op gestandaardiseerde wijze als obductiemate­riaal werden verkregen. Om na te gaan of er een principieel verschil bestaat tussen vezelkraakbeen en hyalien kraakbeen werd het collagene netwerk van het kraakbeen van de kaakkop vergeleken met dat van de heupkop. Hier­toe werd zowel gezond als arthrotisch articulair kraakbeen onderzocht. Aan de hand van de inhoud van de verschillende hoofdstukken zullen de resultaten kort worden weer­gegeven. In hoofdstuk 1 wordt de huidige stand van weten­schap betreffende osteoarthrosis en de structuur van articulair kraakbeen kort weergegeven en worden de doelen van het onderzoek geformuleerd. Hoofdstuk 2 geeft een overzicht van de heden­daagse kennis van de structuur en functie van het kraakbeen van het menselijk kaakgewricht. De samenstellende kraakbeencomponenten - cellen, col­lagene fibrillen en proteoglycanen (tussenstof) - wor­den besproken. Een dergelijk beschrijven ontbreekt in de meeste literatuur over het kaakgewricht. In hoofdstuk 3 wordt de organisatie van de colla­gene fibrillen van het kraakbeen van de gezonde kaakkop beschreven op basis van onderzoek met behulp van de lichtmicroscoop en de scanning elec-tronenmicroscoop. Met dit onderzoek werd voor het eerst aangetoond dat de collagene fibrillen in lagen of bundels georganiseerd zijn. De laagsgewijze opbouw, waarbinnen een vlechtwerk aantoonbaar is, wordt gevonden in de bovenste zone van het kraak­been. Een bundelsgewijze organisatie wordt gevon­den in de diepere zones. Op basis van dit onderzoek kan worden geconcludeerd dat de collagene fibrillen een drie-dimensionaal netwerk vormen met een spe-cifieke organisatie in de vier te onderscheiden zones van het articulaire kraakbeen. Aangezien vorm en functie aan elkaar gekoppeld zijn, mag het verschil in structuur per kraakbeenzone beschouwd worden als een aanduiding voor de aanwezigheid van een verschillende functie per kraakbeenzone. De aard van deze verschillen is echter niet duidelijk geworden. In hoofdstuk 4 wordt de organisatie van de colla­gene fibrillen van het kraakbeen van de discus articu-laris van het kaakgewricht beschreven op basis van een onderzoek met de lichtmicroscoop en de scan­ning electronenmicroscoop. Het bleek dat de colla­gene fibrillen in vrijwel de gehele discus georgani­seerd zijn in bundels die een drie-dimensionaal net­werk vormen. Alleen in de oppervlakte-lagen was een meer voor-achterwaartse oriëntatie, evenwijdig aan het oppervlak, te onderscheiden. Het collagene netwerk van de discus articularis heeft een structuur die geschikt is om weerstand te bieden aan druk- of compressiekrachten. In hoofdstuk 5 worden de organisatie van de col­lagene fibrillen alsook andere morfologische aspec­ten van articulair kraakbeen van arthrotische kaak-koppen beschreven op basis van onderzoek met behulp van de lichtmicroscoop en de scanning elec­tronenmicroscoop. De kaakkoppen vertonen ken­merken van progressieve en regressieve remodeling en scheurvorming in de diepere zones van het kraak­been. Het collagene netwerk heeft zijn normale, straf georganiseerde opbouw verloren. De collagene fibrillen lopen kriskras door elkaar. Bovenop het gewrichtsoppervlak zijn dikke, getwijnde, kabelach­tige vezels te zien. Tussen de collagene fibrillen liggen talrijke bolletjes verspreid, waarvan nader onderzoek heeft aangetoond dat deze bestaan uit vettige dege­nera tieproducten. Geconcludeerd wordt dat desinte­gratie van het collagene netwerk en vettige degene­ratie osteoarthrotische veranderingen van het kraak­been van de kaakkop zijn. Beide fenomenen zijn voor de kaakkop niet eerder beschreven. In hoofdstuk 6 wordt de ultrastructuur van het articulaire kraakbeen van zowel gezonde als arthro­tische kaakkoppen beschreven op basis van onder­zoek met behulp van de transmissie electronenmicro­scoop. Er werd met name gezocht naar aanknopings­punten om de pathogenese te verhelderen. De ver­kregen ultrastructurele beelden van cellen en matrix van het kraakbeen worden vergeleken met de resul­taten van andere transmissie electronenmicroscopi-sche studies uit de literatuur, zowel van arthrotisch articulair vezelkraakbeen als van arthrotisch hyalien kraakbeen. De gezonde kaakkoppen vertonen slechts geringe degeneratieve kraakbeenveranderingen die, gezien de leeftijd (53 tot 88 jaar) van de kaakkoppen, gezien mogen worden als een kenmerk van veroudering. De arthrotische kaakkoppen (leef­tijd 18 tot 48 jaar) vertonen diverse degeneratieve veranderingen in het articulaire kraakbeen. Veel chondrocyten tonen kenmerken van degeneratie of blijken zelfs necrotisch te zijn; dit laatste wordt vooral in de diepere lagen gezien. Het debris dat daarbij resteert, is vettig. Een toename van zogenaamde matrix vesicles en vetbolletjes is daarvan het gevolg. Verder wordt een sterke toename van het aantal elas­tische vezels alsook de aanwezigheid van vele colla­gene reus-fibrillen gevonden. De collagene fibrillen aan het oppervlak vallen uiteen in een fijn granulair materiaal. Zowel deze fragmentatie van de collagene fibrillen als de aanwezigheid van elastische vezels en sterk vergrote collagene fibrillen zullen een nadelige invloed hebben op de mechanische eigenschappen van de door osteoarthrosis aangedane kraakbeenma-trix. Geconstateerd kan worden dat zowel de cellen als de matrix van het articulaire kraakbeen door osteoarthrosis zijn aangedaan. Of het één het gevolg is van het andere of juist andersom kon helaas niet worden aangetoond. Mogelijk treden de veranderin­gen gelijktijdig op, bijvoorbeeld enzymatisch geïndu­ceerd vanuit de gewrichtsvloeistof. De gevonden degeneratieve veranderingen in het arthrotische vezelkraakbeen van de kaakkop blijken in principe dezelfde te zijn als die welke beschreven zijn voor het hyaliene articulaire kraakbeen van andere synoviale gewrichten. Derhalve wordt gecon­cludeerd dat osteoarthrosis een aandoening is van de synoviale gewrichten waarbij geen onderscheid hoeft te worden gemaakt tussen vezelkraakbeen en hyalien kraakbeen. Dit is als zodanig niet eerder beschreven. In hoofdstuk 7 wordt aan de hand van obductiema-teriaal de relatie tussen osteoarthrosis en dislocatie van de discus articularis van het kaakgewricht beschreven, gebaseerd op onderzoek met behulp van de lichtmicroscoop. De kaakgewrichten werden, alvorens ze werden uitgeprepareerd, ingevroren met het gebit in maximale occlusie. De bevroren obduc-tiepreparaten werden op gestandaardiseerde wijze in 5-mm-plakken gezaagd van lateraal naar mediaal, waarbij de positie van de discus ten opzichte van de kaakkop en het tuberculum articulare gehandhaafd bleef. Vervolgens werden deze plakken gefixeerd, werd een röntgenologische contactopname gemaakt en werden van iedere plak histologische coupes gemaakt. Van de 22 onderzochte kaakgewrichten (leeftijd 54 tot 92 jaar) hebben acht een normale en 14 een gedisloceerde of geperforeerde discus articu­laris. Van deze 14 tonen acht gewrichten een partieel naar ventraal gedisloceerde discus, vijf een geheel naar ventraal gedisloceerde discus en één gewricht toont een grote perforatie van de discus. Bij een partiële discusdislocatie blijkt deze altijd in het late­rale deel of het laterale en het centrale deel van het gewricht voor te komen. Talrijke degeneratieve veranderingen, zoals osteo-fytvorming, sclerosering van het bot, subchondrale cystevorming, erosies aan het articulaire oppervlak, vormverandering van de kaakkop, afvlakking van de fossa en kleiner worden van de kaakkop, zijn macro­scopisch reeds zichtbaar. Scheurvorming in het arti­culaire kraakbeen op de grens van verkalkt en onver-kalkt kraakbeen, clustering van de chondrocyten en fibrosering van het beenmerg zijn microscopisch waarneembaar. Opvallend is dat de bovenste laag van het articulaire kraakbeen zelden is aangedaan en het langst intact blijft. De degeneratieve verande­ringen vinden primair plaats in de diepere lagen, de oppervlaktelaag schijnt zich hieraan aan te passen. Alle gewrichten met een gedisloceerde discus, op drie na, tonen duidelijk degeneratieve kenmerken, vooral in het laterale deel van het gewricht. Een dislocatie van de discus articularis, partieel of geheel, blijkt veelal gepaard te gaan met degeneratieve ver­anderingen op dezelfde plaats in het gewricht. Echter vier van de acht gewrichten met een normale positie en vorm van de discus articularis tonen eveneens degeneratieve kenmerken. Een dislocatie van de dis­cus articularis wordt door ons gezien als een gevolg van osteoarthrosis van het kaakgewricht dat welis­waar het proces kan versnellen, maar niet primair de oorzaak is van osteoarthrosis. In hoofdstuk 8 wordt de organisatie van de colla­gene fibrillen van het kraakbeen van de gezonde heupkop beschreven op basis van onderzoek met behulp van de lichtmicroscoop en de scanning elec-tronenmicroscoop. Dit onderzoek werd uitgevoerd om inzicht te krijgen in eventuele verschillen tussen vezelkraakbeen en hyalien kraakbeen. De collagene fibrillen, die in alle richtingen lopen, vertonen bij de heupkop een zeer dichte pakking met een regelma­tige organisatie zowel in de bovenste als in de diepere lagen van het articulaire hyaliene kraakbeen. Vlak onder het gewrichtsoppervlak is het weefsel extra dicht van structuur. Geconcludeerd wordt dat er geen bundels of lagen van collagene fibrillen te onderscheiden zijn zoals bij de kaakkop. De collagene fibrillen vormen een homogeen, drie-dimensionaal netwerk over de volle dikte van het kraakbeen. In hoofdstuk 9 worden de degeneratieve kenmer­ken beschreven van een arthrotische heupkop, op basis van onderzoek met de licht-, de scanning elec-tronen- en de transmissie electronenmicroscoop. Verscheidene degeneratieve kenmerken zijn aanwe­zig. De in dit onderzoek gevonden aanwezigheid van elastische vezels in arthrotisch hyalien kraakbeen is nog niet eerder beschreven. Desintegratie van het collagene netwerk en vettige degeneratie worden ook hier geduid als hoofdprocessen in de pathogenese van osteoarthrosis. In hoofdstuk 10, de General Discussion, worden de verschillen tussen articulair vezelkraakbeen en hyalien kraakbeen besproken. Onze resultaten tonen wel een verschil aan in organisatie van de collagene fibrillen in gezond vezelkraakbeen en hyalien kraak­been, echter de kenmerken van osteoarthrosis op electronenmicroscopisch niveau zijn volkomen iden­tiek. De relatie tussen veroudering en osteoarthrosis komt in het kaakgewricht minder duidelijk naar voren dan in andere synoviale gewrichten, omdat osteoarthrosis van het kaakgewricht veelal reeds in het derde levensdecennium optreedt. Het gangbare concept dat osteoarthrosis zich bij histopathologisch onderzoek kenmerkt door defecten in het gewrichts­oppervlak blijkt voor het kaakgewricht niet op te gaan. Daarom wordt voorgesteld de definitie van osteoarthrosis zodanig te verbreden dat ook de dege­neratieve veranderingen in de diepere lagen van het articulaire kraakbeen en subchondrale bot, waarbij het articulaire oppervlak microscopisch intact kan zijn, erin worden opgenomen. Een partieel of geheel gedisloceerde discus articularis dient naar onze over­tuiging te worden gezien als een onderdeel van het arthrotische proces. Een duidelijk inzicht in de oorzaak van osteoar­throsis werd in dit onderzoek niet verkregen. Hiertoe zal onderzoek in breder verband, vooral biochemisch getint, op allerlei gebieden van het bewegingsappa­raat noodzakelijk zijn.